Looks like it took going to Nevada to sketch this month. All of them are from my travels there. Vertical rocks crop out of smooth hills at the side of one of the huge, flat basins. Cliffs of weathered rocks attract my attention near the petroglyphs. As the snow lessens, the remaining two walls of a creek house are too much to pass up. 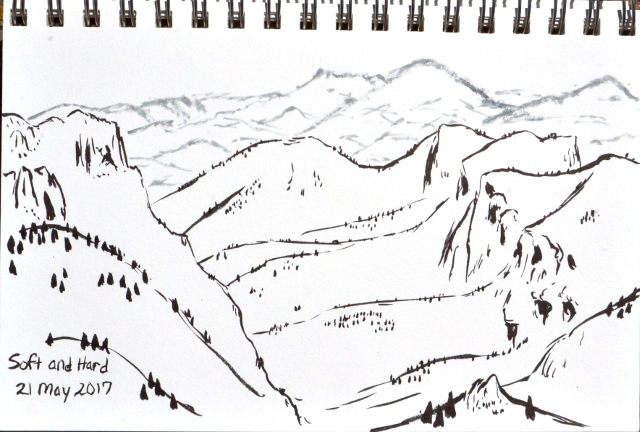 It is always a good time to pause and draw at the top of a pass. Little caves in weathered rocks seem worth a moment. 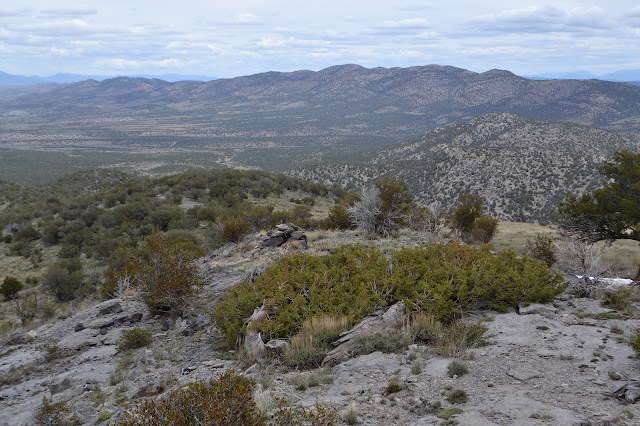 My last day of experimentally determining that Nevada really is not flat is also my last pre-planned hike. I had spotted a labeled trailhead, which is pretty rare on the Ely Ranger District West Half map. 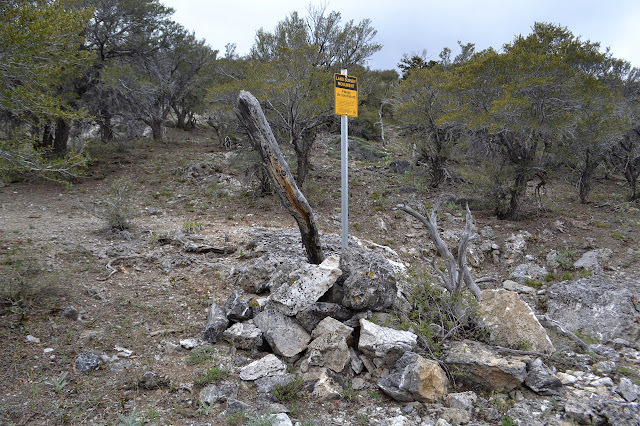 There are plenty of spots where trails hit roads, but this was the first I saw actually marked as a trailhead. It is conveniently located next to one of the total of three forest service campgrounds on the map. I had expected a little more to it than the unofficial site I had the last two nights, but it only has tables, fire rings, and a bit of space. 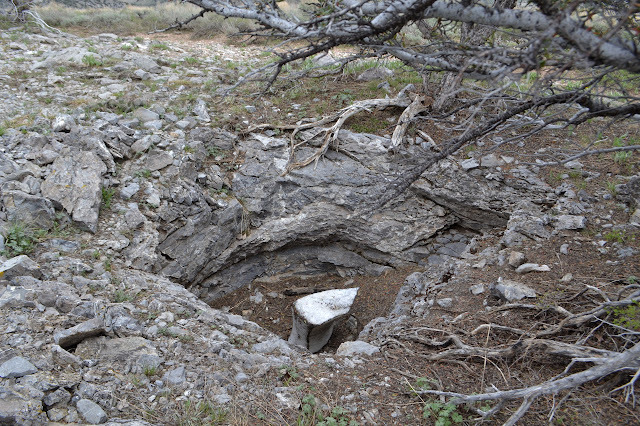 They do claim online that there is a pit and four sites. I only found three of the sites, maybe the pit is by the fourth. (The map indicates no restroom.) The site next to the trailhead was already taken when I got in in the evening, so I grabbed the next a bit down the road and around a canyon corner. They left early and, as I found in my walk to the trailhead, had an enthusiastic campfire they could not be bothered to put out before driving out. That is the sort of thing that can make a southern Californian think very unflattering thoughts about another human's worth as a person even when home is not currently experiencing another human caused massive wildfire. 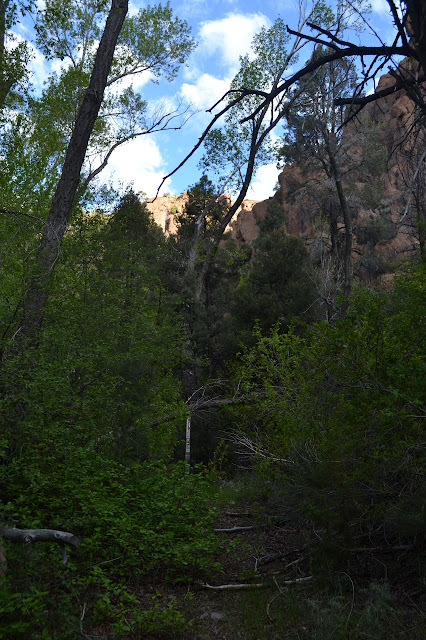 It is a narrow cliff enclosed canyon as Little Cherry Creek comes into Sawmill Canyon. Even poking around the corner, it is hard to see the other site. The trailhead has an information sign with some generic information about national forests and an admonition to be a good neighbor and clean up the campsite next to a mildly broken trail register with generic information about traveling and camping within the wilderness, but no pages to actually register. Behind it is a distinctive trail that could use a little work. It is a little worse than hoped and a little better than expected. The creek is just a little too big to cross without wet feet or aids and there are rocks or sticks to aid when needed. It does look like this trail gets some use. 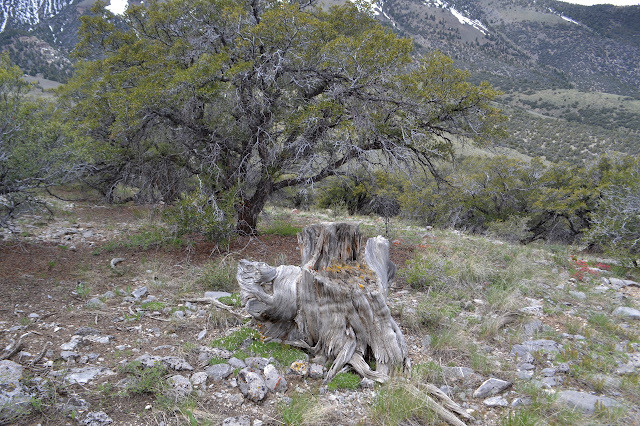 A few downed trees, including one held up by a wilderness boundary sign post, but generally very distinct trail. It started off a frosty morning where I helped the ice off with a bit of windshield wiper fluid, then passed through a shadow and had the whole mess freeze again. 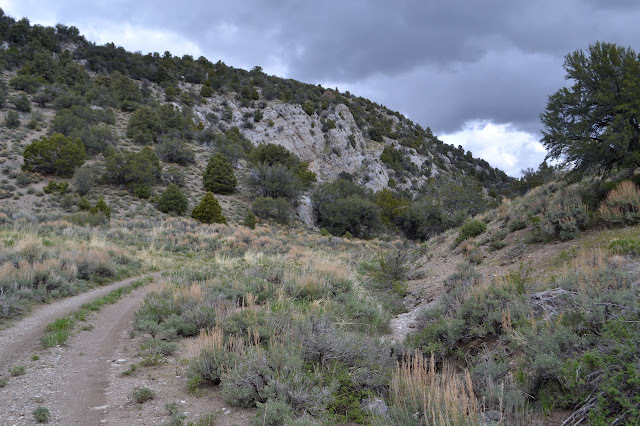 After getting that more completely taken care of, I could head off to the edge of Quinn Canyon Wilderness with some stops on the way for hikes. 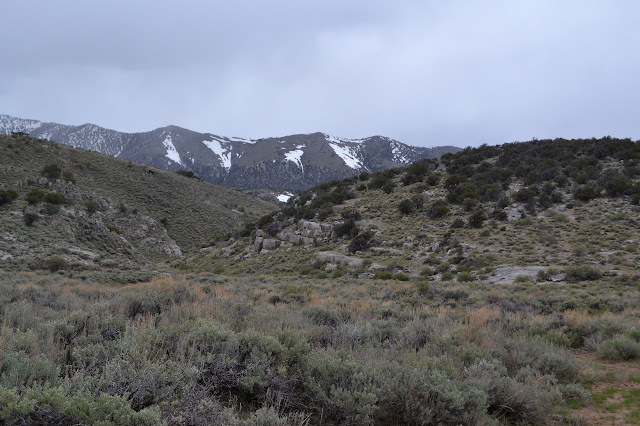 The forest website claims that, "Extreme isolation defines Quinn Canyon, a remote central Nevada Wilderness." I am not so certain about that, but there is definitely not a lot of help in getting there. 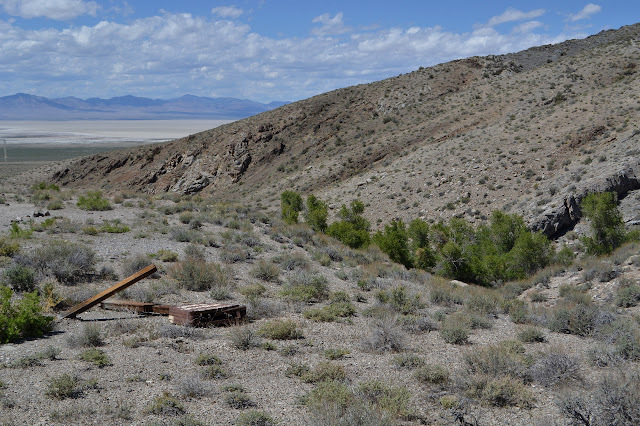 I turned down the highway to find one of two dirt roads with absolutely no designation that head south from Current, Nevada. 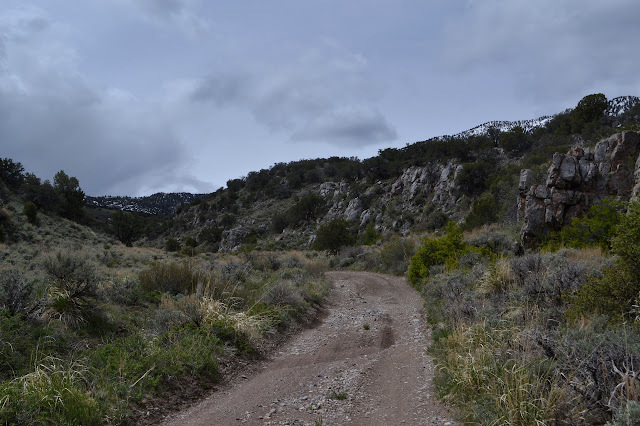 The 4WD road that weaves back and forth across it is the Midland Trail. I went right through Current because I was expecting to see a sign that said something like "Current" on it. I had seen the school and it nagged at me that this was probably thought of as a population center for the area. There were also about six buildings, half of them clearly abandoned. For a second try through, I still could not find even one road heading south. On a third try, moving very slowly, I decided that the stop sign in the gravel probably designates a road from the rest of the gravel. 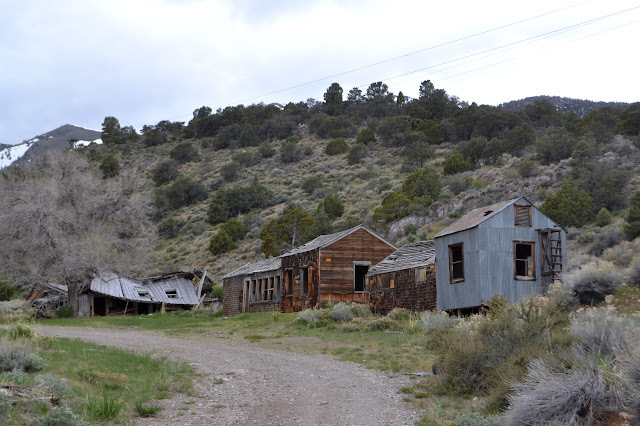 I drove through the abandoned part of "town" and south on a very smooth dirt road. The road dropped through a tight spot into a canyon, which was not in character with what I expected. I expected an entirely open and flat and distinctly south drive. The canyon was pretty and all, but wrong. The road also gradually turned east and as it left the canyon was barreling very much east. I was on the wrong one. As I hit SR-318, not that there was anything to tell me that is what it was, there was a mileages sign for those headed the other way. I turned south to make the other attempt at finding my way via a road from Sunnyside. I found out I was one day off from finding the road closed for an Ely to Las Vegas road race happening tomorrow, but I did not exactly find Sunnyside. It also has no sign, just a compound of buildings for an administrative site. 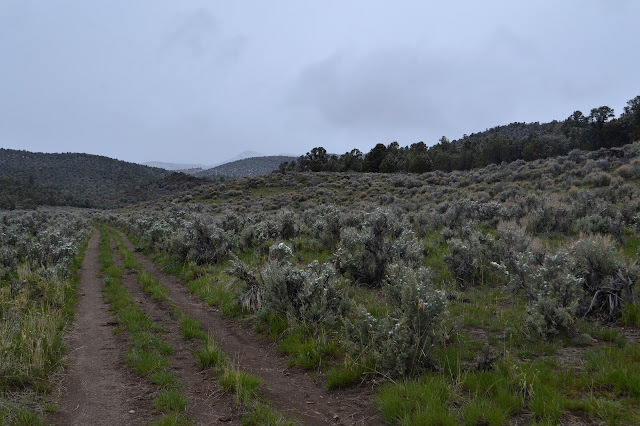 On the far side of it was the road I wanted, marked Kirch Wildlife Refuge. I had seen that as something along the way, so made the turn. This, too, has a mileage sign including Cherry Creek Campground, my expected stopping point for the night and trailhead for tomorrow. I was feeling good about probably making it on this very long way around. This road does have signs at the intersections. 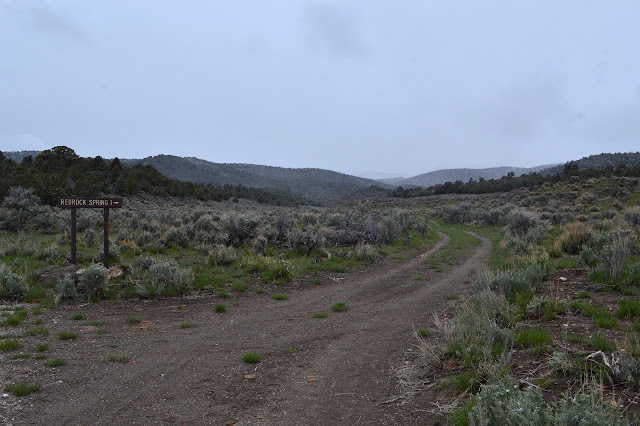 Except for one ranch that has a road in looking just as wide and used as the main road and did not include an arrow to show which road it is marking as it sits in the middle of the Y, everything was obvious. I probably should have changed my plans to something along that side, but I got determined to make sure I could get to the camp. I could. Then I went over the top to find my original destination. It was only mild guesswork to miss the ranches on the far side. At the bottom I realized that in a way, I was lucky to come from the other side. How would I ever have known to take a turn at the two mailboxes supported by an ancient oven clearly used for package delivery. There was also a third mailbox off on its own on top of its own wood crate partly flattened by some errant driver. I would have thought it was just another ranch road. I guessed the miles to my next turn and had to get out the tracking GPS and estimate what it should read to be sure of it. I got really confident when I found the DUCK benchmark. Again, there was no sign. There had been one once. I started up the smooth technically 4WD road and finally found signs at the forest boundary. A little slapstick showed the road designation, 420, and as I looked left, I noticed the fallen form of a Humboldt National Forest sign. I had arrived in Troy Canyon where I wanted to be quite a few hours after I expected to. I should have grabbed the parking available there as the road starts hitting some harder and bigger rocks after that and getting a bit more serious about being 4WD. I foolishly pushed on in the baby car and tucked it in the first spot I saw to park. 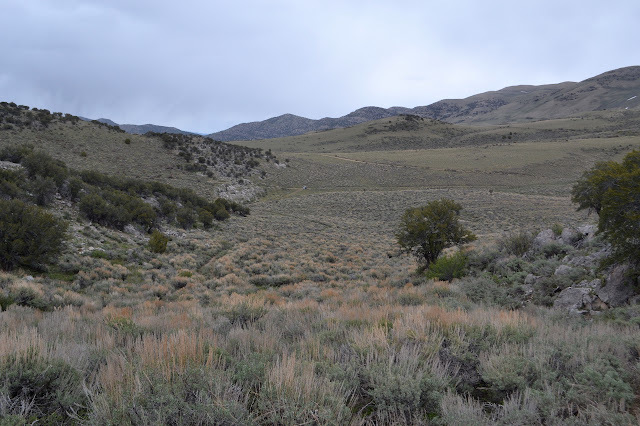 This is, it turns out, just short of an established campsite and slightly less short of the first creek ford. There was a ford of a ditch on the way in. And while I realize most people reading through all that might be thinking I should get with the times and get a smart phone, I feel like AAA needs to launch another campaign for road signs. The road is easy walking and likely easy driving except for a few rough spots and the constant worry of having to deal with meeting someone on the road. The ford has no place to cross with dry feet for the lone hiker and a trail off to the side just goes to another spot on the creek with no way to keep the feet dry. It is a slightly warm afternoon and I plunge in. Another hike with extra heavy shoes and wet socks, but the alternative of taking them off to cross requires actually stopping. After Bald Mountain, I still had half a day to play before getting down to camping for the night. 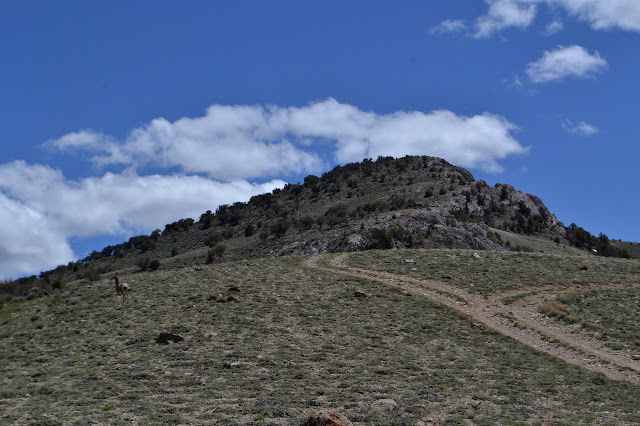 I decided to go up Indian Garden Mountain, which also shows a little triangle at the top on the map. Benchmark! 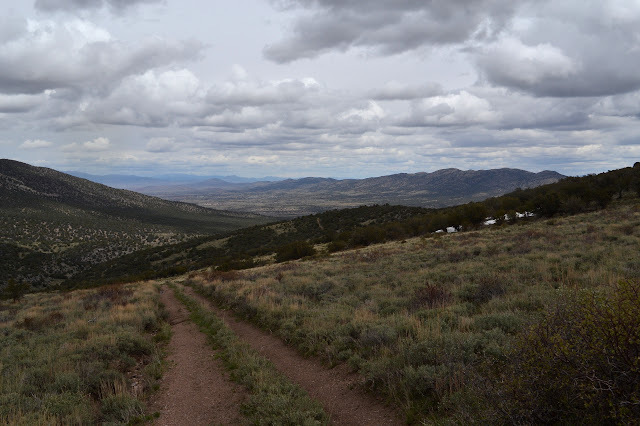 Although I could just start from camp again, I decided to drive up a few miles to a saddle. I had come up this way a little the day before, so knew the road got a bit rough before the intersection and they always seem to be rougher after an intersection when turning away from the highway. There was nothing too much worse this time and I even found a beautiful parking spot right next to an unexpected road heading up the mountain at the saddle. 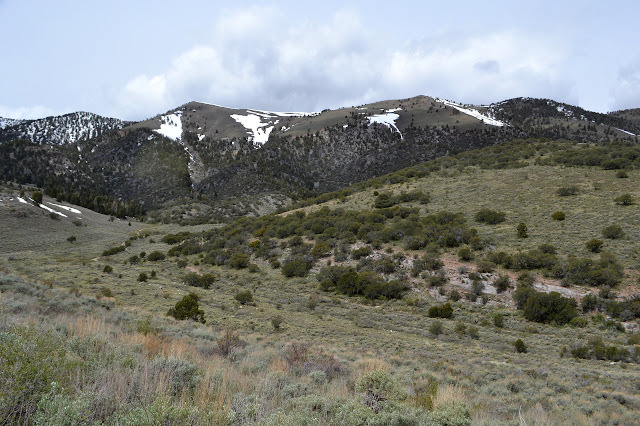 The first of the ridge line peaks on the way to Indian Garden Mountain and a mule deer. 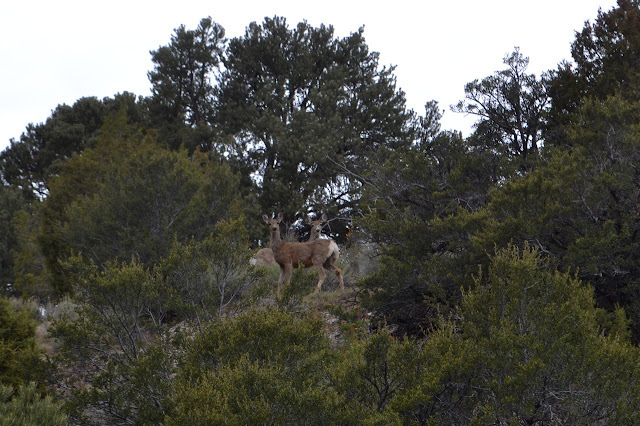 This whole area is absolutely crawling with mule deer and elk. More mysterious road, although this should go a short way to a prospect and stop, on the other side. Mount Hamilton is in the background. I found a nice camp spot where the USGS map shows three buildings but now there is only a picnic table, campfire ring, and plenty of room tucked in beside the Bald Mountain Wilderness. It is possible that the prime little car accessible starting point is a little up the road from here, but there is not sufficient advantage to bother scraping off the frost to drive up there. Still cold, but not snowing. 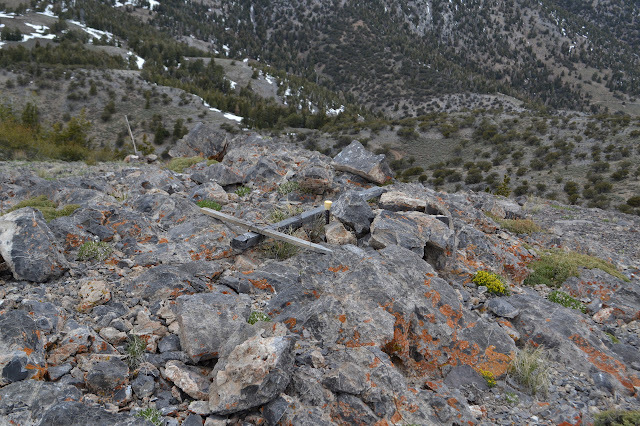 With my pack stuffed and appropriate maps tucked in, I just start up the low ridge north of the site. There are some bumps along the way it might be easiest to avoid, but otherwise navigation is just to follow it up. Just to be sure I head in the right direction, I estimate the peak position off my map and drop that into the GPS. It is only 2.6 miles away. Current Mountain from a little way up the ridge. The ridge is tree covered and there is not a lot of view except at a few more open spots. Winding through the trees and avoiding low branches pushes me down one side of the ridge or the other. The south side is steep, so I tend to the north. 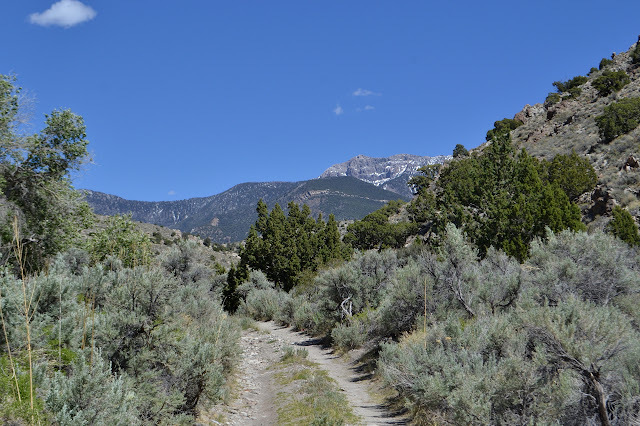 There are thin pony trails along the top and pony trails are definitely the best. Most the game actually using these trails are not horses and will walk under rather low branches quite happily, but there seems to always be a little extra walk around trail from the taller horses. Mostly lots of trees to see as I progress toward the higher land up ahead. 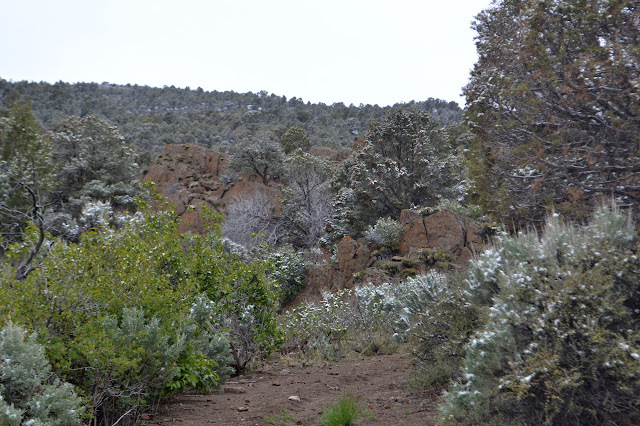 A light dusting of snow remains on nearby Indian Garden Mountain. To the left, Mount Hamilton has a lot more snow. My attempt to go around the bumps along the ridge is thwarted with the first along the way. 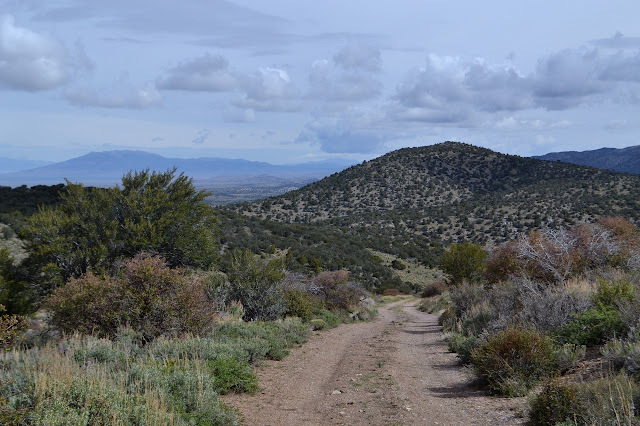 It is really not so far up, these often have so little drop on the uphill side that it is of little consequence, and the top affords a much better viewpoint than most the spots along the way. The draw of the peak is just too much, even a little tiny peak. At least the point of the hike today is peak bagging. I go for it and it is a nice and open place to pull out the map and decide which bump I am standing on. Then consult the GPS and find it is actually another bump anyway. The road around to White River got rather rough in spots, but never too much for a little careful first gear work. The road along White River after a junction turning once more toward the highway was much better. I decided to hike to another spring that was on my map with a road toward it. Finding the road was not so simple. This one has no sign.. I eventually selected a track in roughly the right place and without any markers saying it was not a road. I even took a little time to search for a benchmark that should be nearby, but was unable to find it. There had also seemed to be a road a little west (should be very short and going to a prospect) and a maybe second near a campsite with a toilet to the east. 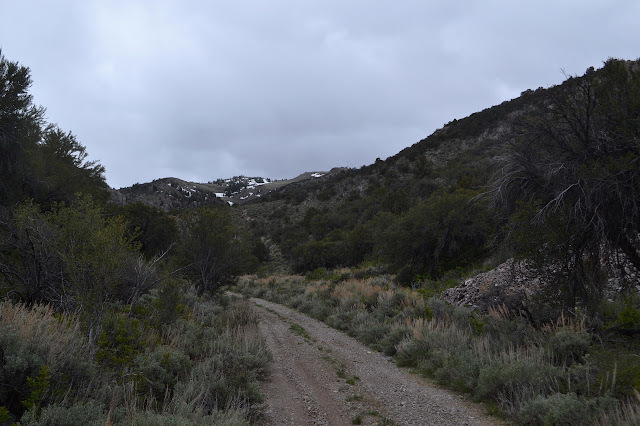 A little more west was an obvious road to the south which runs to various mines and springs. Across the White River to the south there are already a bunch of mountains to look at. Current and Red Mountains dominate their respective areas. The road is initially a clear, sandy track between the trees. It looks like something far too long established to not have markers blocking it if it was not meant to exist. 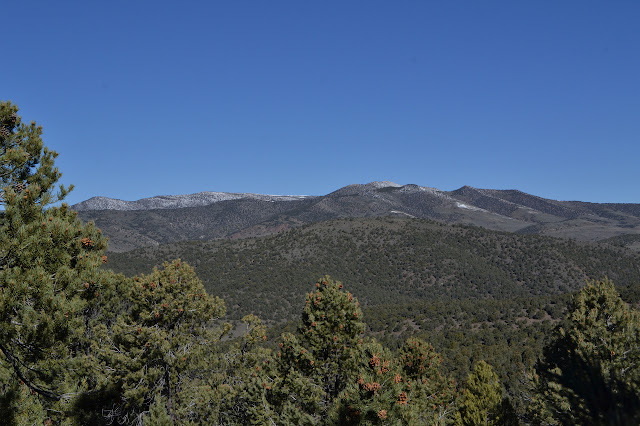 Along the way, most of the view is of pinon pines. 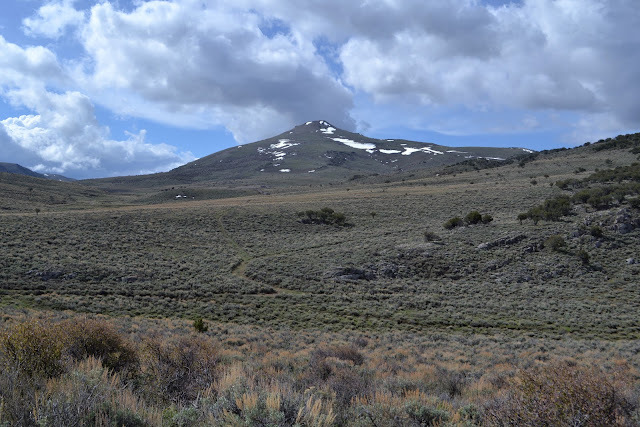 I do have a landmark, a distinctly cone shaped nearby peak. It should stay about so far to my left while the specific direction to it slowly changes. This is my landmark to judge if I am going in roughly the right direction. Following a smooth, sandy road with a cone shaped peak off to the left. The road abruptly changes to two rough tracks although it is supposed to be much longer. 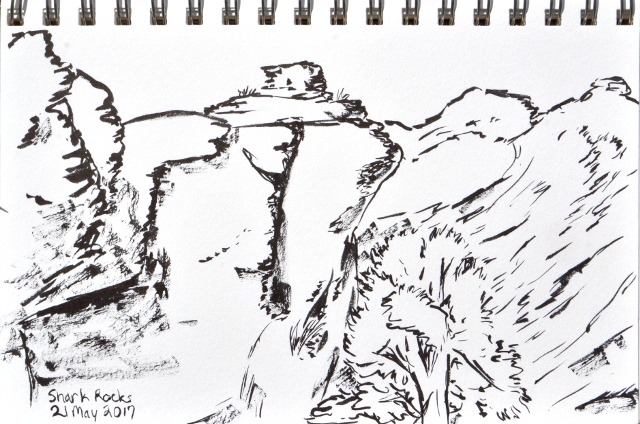 An elk skin that looks distinctly like some hunter's lost trophy sits at the edge of the transformation. I can see where vehicle turned around here, but another continued. The fading tire tracks make it easier to follow the fading road. I woke up under a blanket of snow and thought it had stopped, but after knocking it off the top of the tent so it would not drop in when the fly was unzipped, I heard the soft and determined stomping of snowflakes landing. I decided it was probably time to move along. The snow was sufficiently determined to cover things in a minute or so, but once the car was warm enough that the flakes hitting the windshield melted, it was not even enough water to run the windshield wipers once in a while. I came around the long way to Ellison Creek and the old guard station. The rather good "unimproved" road deteriorates at the forest boundary. 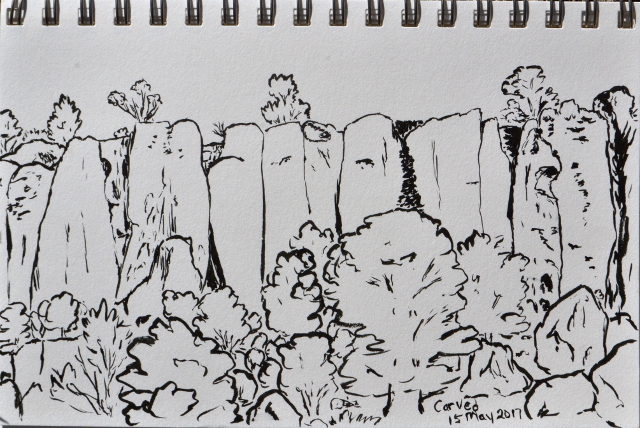 There are more ruins of stone buildings along the way beside the creek. 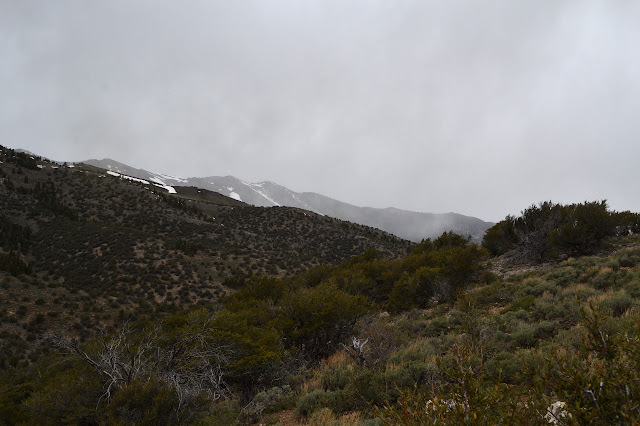 It was still snowing, so I turned toward White River, which is lower in elevation. Not much further, there is a sign with actual words on it for a place just a mile away. I decided to see what deserves an actual sign. Since most little roads are rather rough, I decided to stretch my legs a bit while I did. Two tracks through the grass and sage with a sign. The road is smooth with little rut as it passes by empty troughs set out for cows. The cows are not yet here to graze. I could probably have driven it to about 200 feet short of the end where there is a campsite. 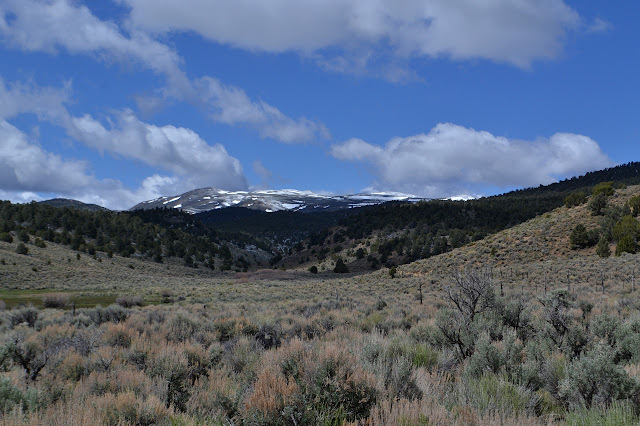 Lots of flat expanse covered in sage brush which today is covered in snow. 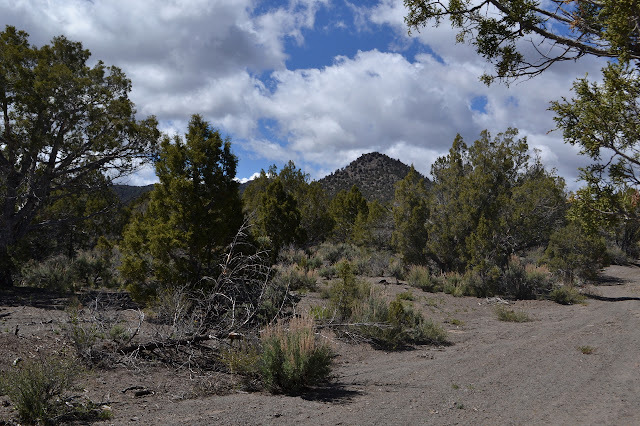 Past the campsite, the road has some deep dips and a slight parking area at the confluence of two dry washes. There is clearly no spring. Thin trail goes to the right and thick trail to the left, so I follow left. There is some pipe rubbish along the way. This climbs up toward and then into some red rocks. That seems appropriate given the name. A few hard rocks sticking up nearby. It was an extremely windy night full of worry about losing a stake until I realized I already had. As I placed it back and an extra to help and pulled out the never-used ties specifically for holding the tent tight in windy situations, I found it had snowed but the only evidence left was a small drift tucked under one side of the rain fly. By morning, there was snow settled on everything, but it was sunny and it all quickly melted. 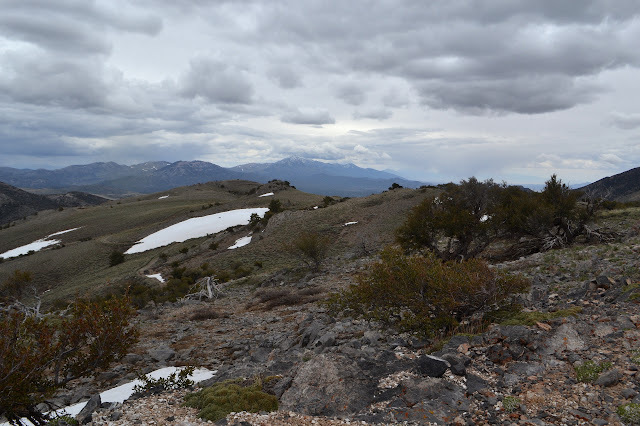 Looking over to the highpoint of the Shellback Wilderness, it looked like this would be a fine day to go even with the snow of the previous night. Unfortunately, the "light duty" road I wanted to take decays sharply as it crosses the forest boundary where it is marked with a vertical number. This means 4WD. As I pushed on, it seemed simple enough although narrow. Crossing the creek, I came to a nice section of ditches to straddle and had to ask myself if I really wanted to push on down this road for another eight or more miles. 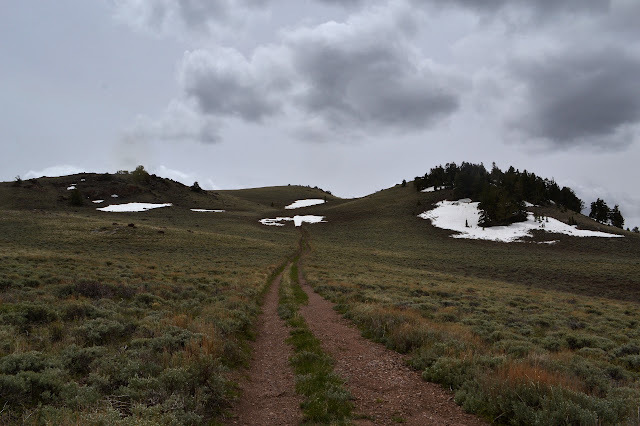 Or I could go back less than a quarter of a mile and get started hiking up the dashed line of a jeep trail I had spotted a yesterday and thought could be a good hike. Maybe staying lower would be a good idea. I turned back and found a place to park by the invisible confluence of Cottonwood Creek and Illipah Creek. 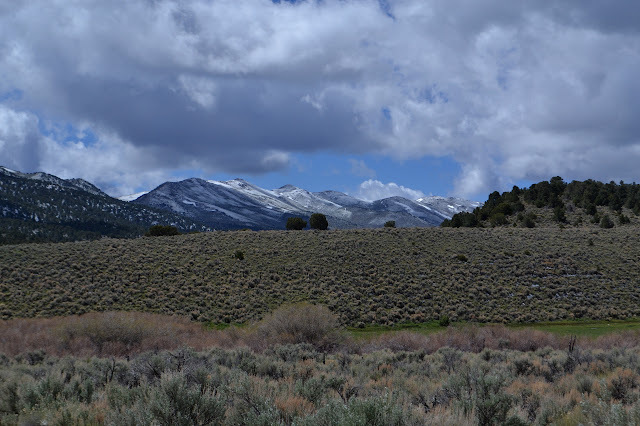 Looking up Harris Canyon and Illipah Creek toward the Mokomoke Mountains. 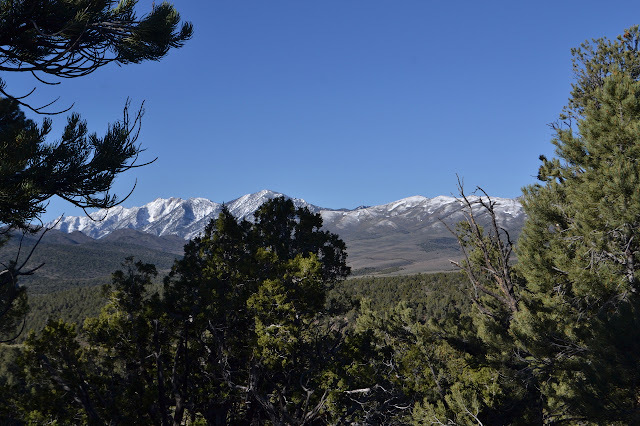 Looking up Cottonwood Creek to the Shellback Wilderness high point, which is marked with a Cottonwood benchmark. The dusting of snow does not look so bad. I started and finished the day checking out parts of Hamilton. 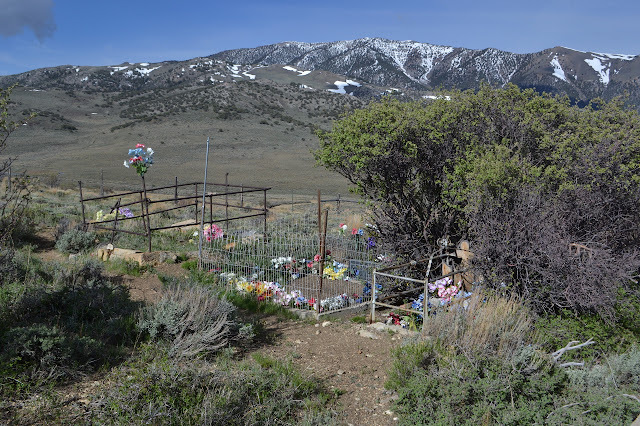 There is another state historic marker dedicated to this ghost town and its neighbors (Eberhardt, Treasure City, and Sherman Town) on US-50 across from the road into Illipah Reservoir and probably the most accessible route into here. It points out that this was an important place in the region once. It was the first incorporated city in the county and became the county seat in 1869, but was already disincorporated in 1875. When fire destroyed the main part of town in 1873, very little was rebuilt. After another fire destroyed the courthouse and county records in 1885, the county seat eventually moved, too. The marker notes there were as many as 10k people living around the Treasure Hill area around 1869 while the Wikipedia page claims 12k people just in Hamilton alone at the same time. 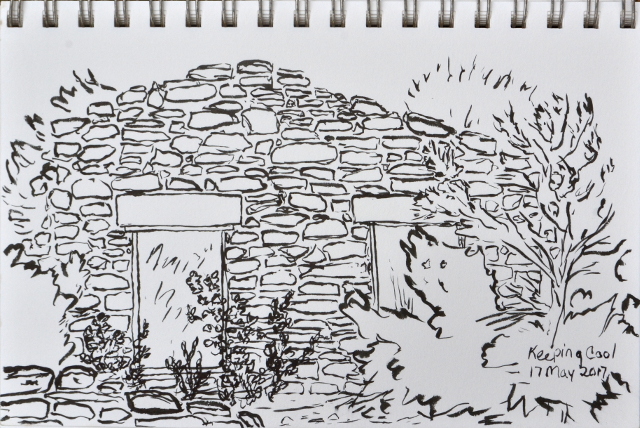 In the morning, I looked around the cemetery (location) and a ruin I expect was a church (location) simply due to the proximity and size. There was an Episcopal and a Roman Catholic church. There is every likelihood that I am wrong in this designation. There is a helpful sign pointing the way up to the cemetery from the main road. The ruin is next to the road. 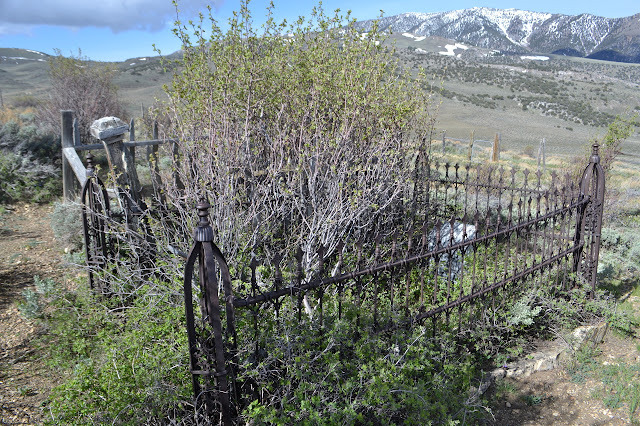 The cemetery on the hill is surrounded by a fence to keep the cows out with a gate for entry and a cowboy gate suitable for a hearse. 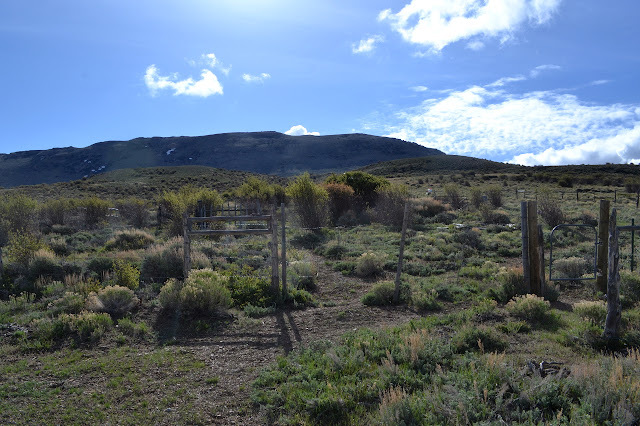 The richer residents have their own fencing to help keep the cows away. The close grave is a young man who was almost 25 years when he died in 1898. Some of the graves clearly still have family who can come and care for them. The near grave is from 1890 (and only 4 years old) and the next one 1934 and 1939, long after the city became a tiny community. I was heading up to Treasure Hill to look around for the day when I got distracted by a geocache just short of Hamilton. I had just found one at the cemetery and there were very few others because they seem to only be placed in special spots around here. It is off my path, but curiosity got the better of me. I started to drive the road in the direction, but it was quickly apparent that it would be at least a little foolish to continue. I had packed my pack in anticipation of finding some short hikes to do, so this would just be the first. What little is left of Hamilton with Treasure Hill rising behind it. The area is riddled with mines. 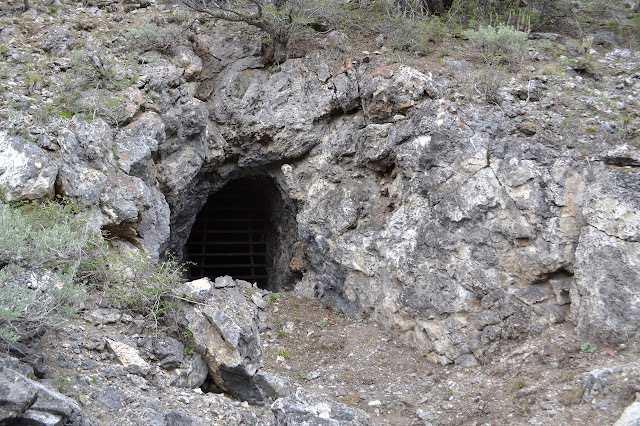 The first one I notice is only a few hundred feet along and tunnels deep into the rocks just a few feet below the road. I wonder how safe that little bit of road might really be. The road splits, one bit heading north and a little east, one heading west to connect up with a canyon going northwest. That seems like my route since I need to work my way northwest. It does not matter how I do it, though, and there is a little peak beside it all, so I climb it on a whim. I will just grab the road again down in the canyon on the other side. After a rocky bit, the narrow road is smooth again as it winds downward. The peak ahead looks like a fun little climb. The ridge is quite easy to climb. There is metal litter all along the way and many old stumps. An old fuel break must have been cut. Very old as the trees growing on it now have gotten quite substantial although not as big as those that were cut. I pause at the top, then make my way down the steeper slope on the other side to the road below. On the way, the sky gradually reminds me that I meant to have my raincoat with me no matter how short a hike might be. Very nearly at the top. 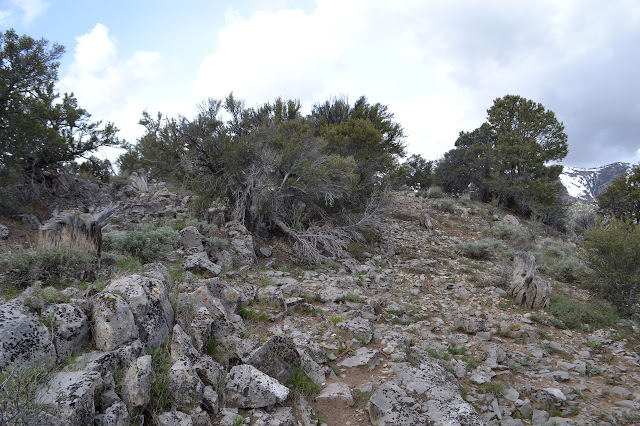 Just a rocky slope generally covered in pinon pine and juniper and stumps. Down in the canyon and on the road again, I continue to wander downhill. It gets me closer and closer to the point in the GPS. 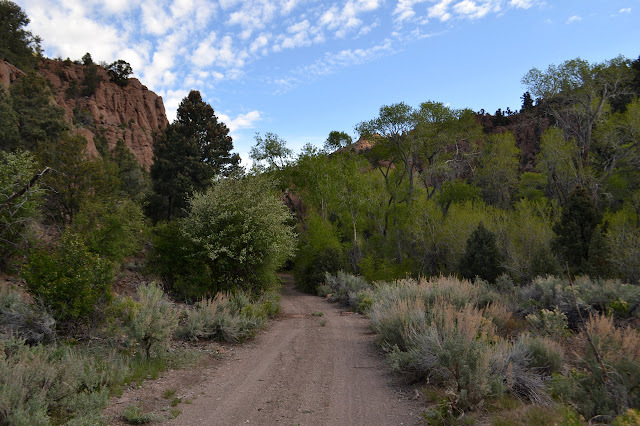 The creek bed of the canyon is dry as the road makes the few crossings. Everything about the canyon says very little water comes here and what does goes again quickly. Dry and rocky from top to bottom. There are a few grasses in the bottom, but they are dry too. As I get very close, the road begins to turn away, but there is a junction. Turning up the next canyon, there seems to be a post or two up on the hill. Something has been built up there. A pair of deer look down on me as I turn a corner to find quite a lot is built up around here. First I see a row of buildings, the last one collapsed, then there is the Belmont Mill. I believe I am being watched. A row of buildings all signed "property of the US Government". Belmont Mill from up on the hillside. Roads go all over the place on my map, especially around a nearby spot labeled "mill site" as well as the one labeled "Belmont Mill". There were roads coming from the west by where I park, so there is probably something back from this road. I continue up the new road looking for any place to turn left. A tram system was built on the ridge to my right and the cables still stretch between the pylons. Part of the tram system between Belmont Mill and Belmont Mine. The cable can be seen against the snow field on Mount Hamilton. As I follow the shallow McEllen Canyon gently upward, there is a pair of tracks heading off to the left. They do not look used, which around here probably means they stop at a hole in the ground in a short distance. I cannot see any evidence of road further up on the ridge. As I continue south for quite a bit further, I start to second guess not at least looking up along the overgrown tracks. A narrow road up a gentle canyon. 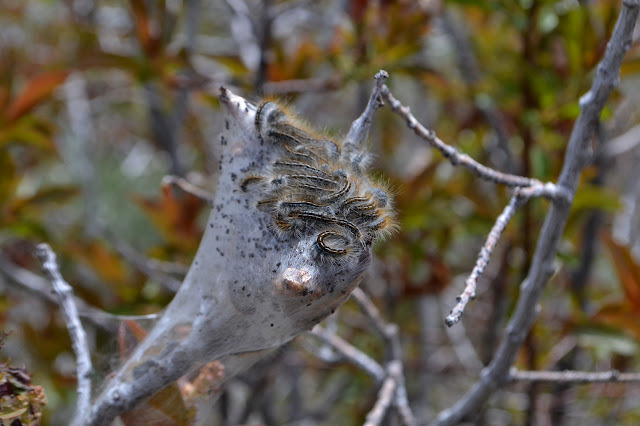 The web nests of tent caterpillars are all over the place. Finally, there is another option to take a left and start climbing the ridge. It is nice to climb after the easy canyon. I find myself chasing after a pudgy creature. My mind immediately identifies it as a marmot. 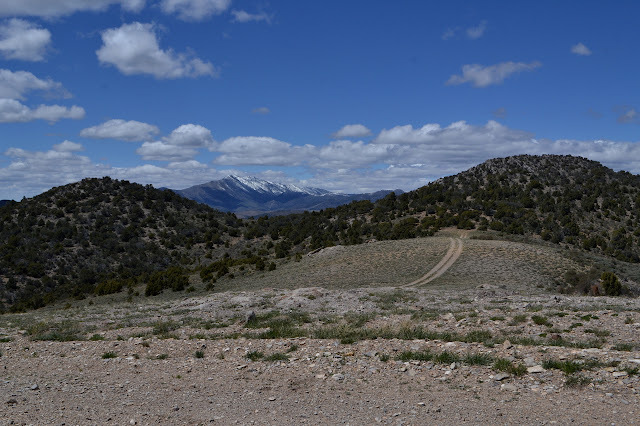 As I stop and think about the marmots at Trail Crest, the marmots at Mineral King, the marmots at Matterhorn Basin, and my poor little car sitting defenceless on a hillside, it stops to look down its striped nose at me. Marmots do not have stripes. It is a badger. I let it relax as I go off to investigate a section corner. The badger is still on the road when I get back, but has had the time to figure out where to run other than along it. As I keep climbing, this road does seem to curve off to the south rather than quite getting to the top. Again I am questioning not investigating the other track. The other road curves west toward Mount Hamilton and divides to reach a few rather large mines. The road does top out on the ridge, but continues to climb. The vegetation changes as I go south. That little thought that I may as well climb something starts to creep in again. I may be turning into a proper peak bagger. As I get nearer to the bump I chose, one of the bumps ahead starts to look like it could be the high point of the ridge. There is a spine coming down from Mount Hamilton to it. Checking the map a bit more carefully and with a little more to match up, it seems to agree. The high point is not much further. As I go around a patch of snow on the road, it does not look like there are any tire marks but there do seem to be some old footprints. I wonder who else is hiking this area. The top is nigh and the vegetation will change again. There is a little more snow as I go. 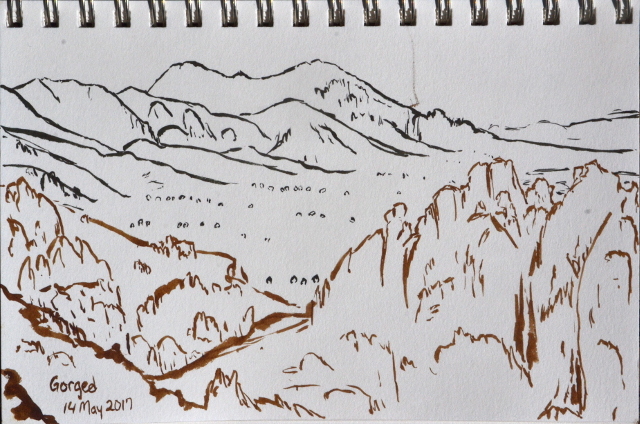 I peek over one little crest to see how far it is to the top, then cut across a high spot while the road dips downward. There is a sign for a "dangerous mine", but all I can see is a snow patch with a bit of a depression. A vertical shaft hidden in the last of the snow. The road stops at another prospect just short of the peak. At the top, there it is, the sudden new views. The Mokomoke Mountains rising up behind what little is left of Hamilton. Coming to the top of Babylon Ridge where following it further is generally downhill. Suddenly there is White Pine Mountain to see. Surveyors have been here, but left no monument unless you count a bit of rebar with some animal chewed plastic glued on. Without even my rain coat, it is cold up here. I try to take it in while snapping pictures quickly, then retreat the way I came. This time I follow the road as it dips and find a junction for where it drops back down to the west. That is definitely not my way back. I follow the road some more and as it curves away to the west, I follow the ridge. This one, too, has many old stumps. I pass by many more prospects, eventually not even marked as dangerous, and many claims, because some of these artifacts are not quite as old as the 1860s city of Hamilton. A cairn along the ridge after leaving the road. 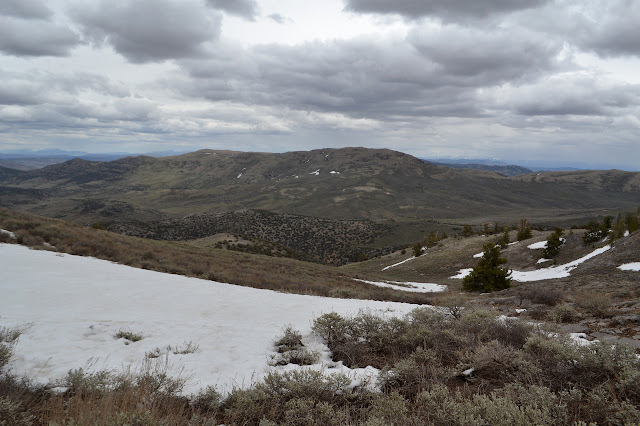 The very last remnant of snow in a prospect along the way. There was no road over the top that I missed. The one spot that looks like it might have road coming up very definitely stops just before the ridge. I will have to make my own way down the other side, so I just pick a spot that seems less steep. The stumps follow me down even in places that would never be part of a fuel break. 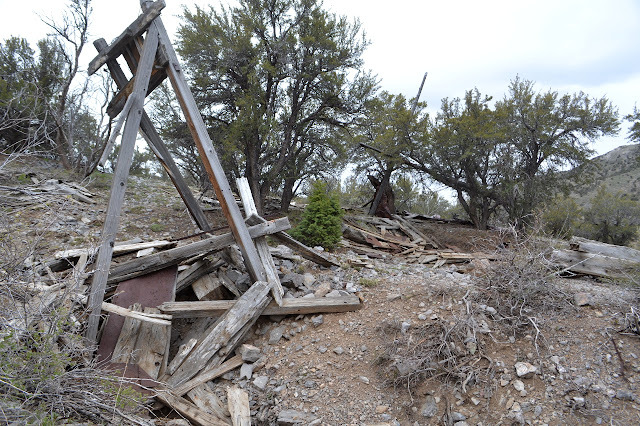 The whole area must have been denuded of trees when the mining was in full swing. 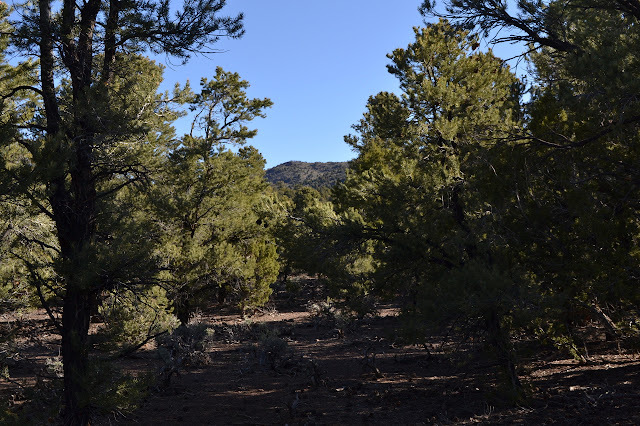 Something has to fill the kilns to make the charcoal, so why not the sparse old trees barely making it on a high desert mountain? The very biggest trees today, which were probably little and ignored trees 150 years ago, are not quite so big as some of the stumps. Life is tough and then someone comes along with an axe. Still here in death after all these years. 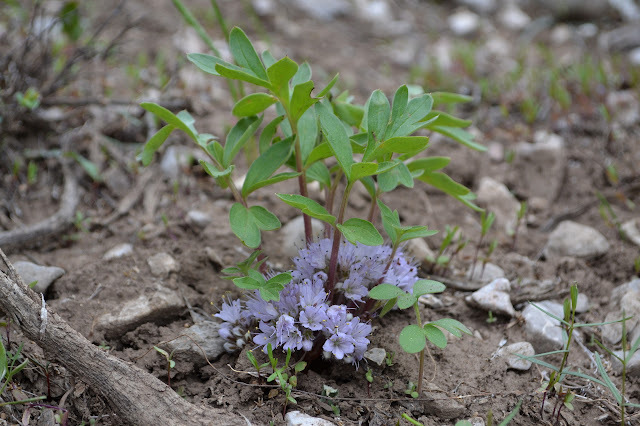 A flower that provides shelter for its visitors. Progress down the hill is rather easy until the very last section where there is a large mine site. 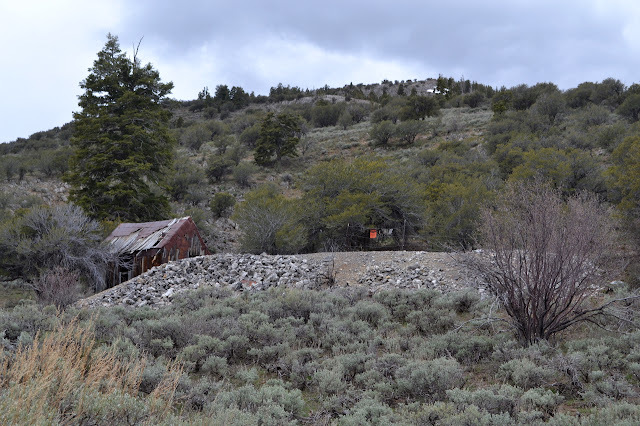 Between the huge vertical mine shaft with tunnels branching off twenty feet down and all the rubble removed from it sitting on the hill, it difficult to find a path until I get around to the other side. From there, a path has been made. At the bottom, I look back at the bright red danger sign beckoning for visitors. It looks familiar. As I glance across the road, there are my footsteps. I recognize the sages as I pass where I came down from the first little peak. It should not be far now. 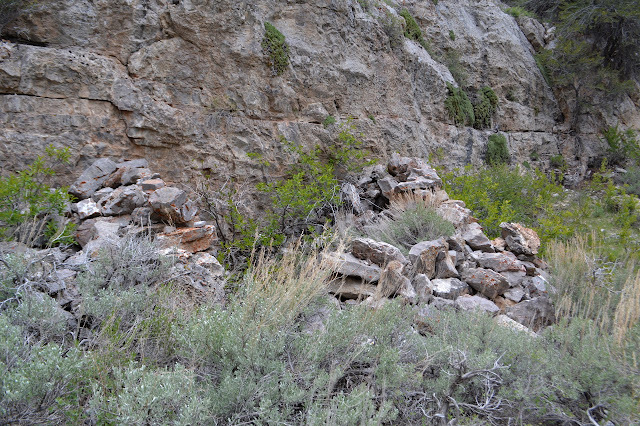 There are the remnant walls of some small rock building on the right. There are quite a few mines along the way. They become larger as I go and have a new sign: "bat habitat". The gate on these is much heavier. Saving bats from a high probability danger due to careless people is probably a worth a little more effort than saving people from putting themselves in a low probability of danger. The people are informed, somewhat. Following along the road at the bottom of Truckee Canyon. Above are the hills I was traveling on the ridge. I could have come down sooner and cut off some of this easily enough. Mortar free rocks walls are somewhat of a pile of rocks now. Whenever the canyon walls get rocky, there is a mine. The bats may come in, but the people must stay out. As what should be a short walk seems to go on for well over a mile, I am double guessing my route again. Apparently that road did not really exist the way I thought it did. 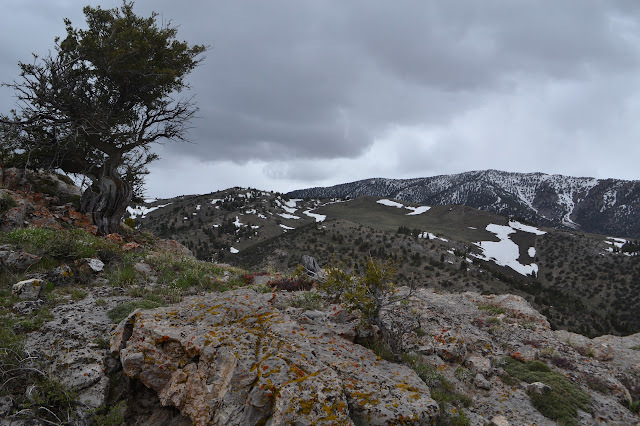 I look for a spot where the ridge is short as I find myself getting just about as far south as I was on the peak. At least it is a little warmer down in the canyon where the wind does not blow as much. I am about to go for it as I turn a corner to find something very interesting. There is an actual tin shack. There are a few places locally named for them, but none of them still exist as far as I know. Of course this one has its own mine just outside one door. 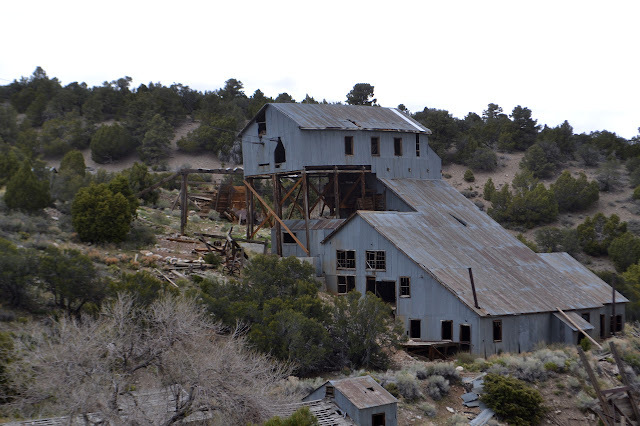 A tin can shack next to yet another mine. Actually, this was quite a nice shack that had elevated wooden floors. 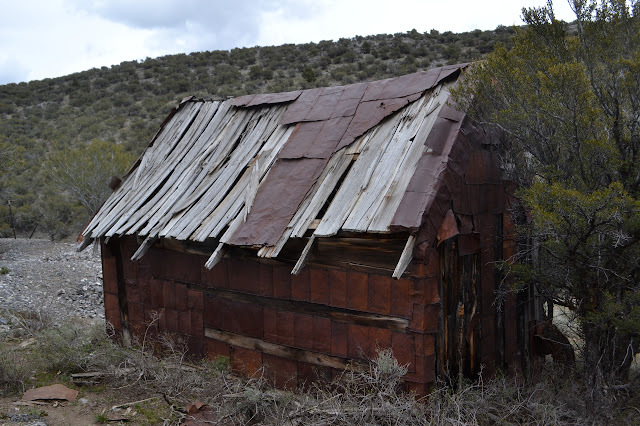 Tin cans have been split and unrolled to make roofing and siding to toughen up the old wooden building. Bonus land survey monument from when this was all getting built up? 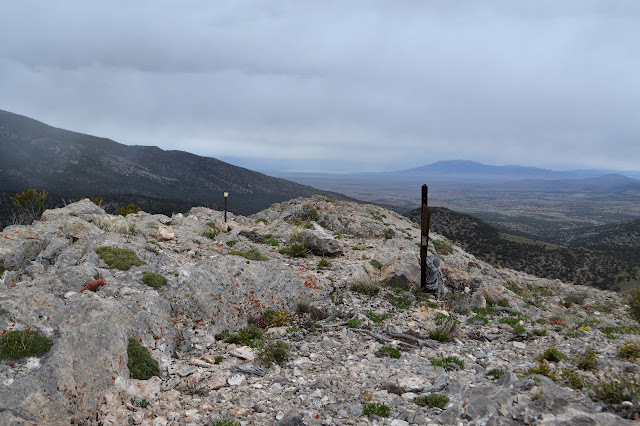 This is area referenced to Mount Diablo and it would have taken them a long time to get out this far with the survey. It also seems a little off from the current PLSS grid. The find of the old cabin has lifted my spirits and made me feel like at least it was worth coming this far from where I was hoping to be heading. I still go trotting up the drainage on the other side of the road to see if it really is a low spot. It certainly seems so until I get distracted by some more metal and wood that accompanies more mine shafts. 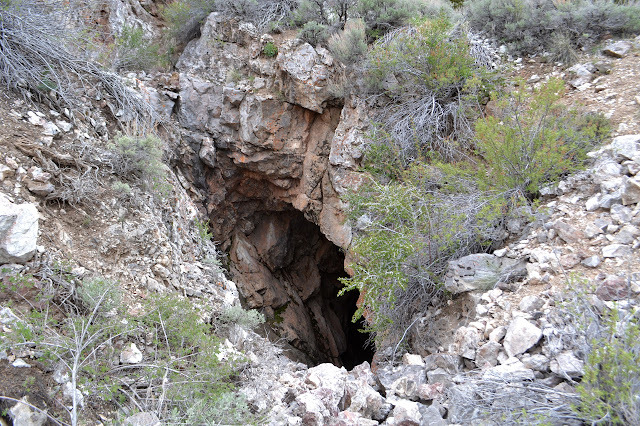 This one has tight bars like the bat caves, but no sign. Some rather ruined auxiliary structures for dealing with a vertical shaft. There is a road just the other side of the mines. I suppose it was probably about to give me what I wanted after all. There are a series of closely spaced forest boundary signs leading off from a land corner marker rather pointedly placing the mines on the forest side. I turn to follow the road up the ridge a little sorry to give up the little bit of protection from cold wind that it offers. The road follows right on the ridge. 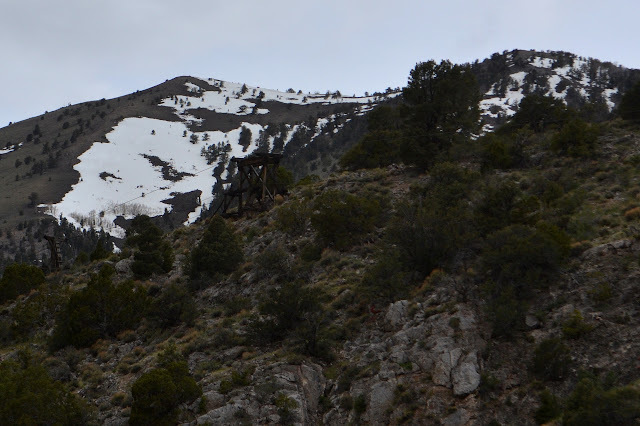 Oh, yes, and there is definitely a bit of snow back in McEllen Canyon while I hike around without even my raincoat. A very mangled, overturned car rests beside a junction. That road heads down into Hamilton. I can see the cow ponds down there. By this time I am having no patience with following a road around. I want to see my car and walk directly to it. Those ponds were far south of where I parked. Ridge walking will be far more direct than curving around the side. Cold? I do not care. Wind? I do not care. I can duck into the lee side of something if it gets to be too much. There are a few flakes dancing around me but nothing short of thunder will drive me downward. The area looks to be popular with dispersed campers and once had another stone building. I scare up another badger. They do not spin their tails around while running the way marmots do, either. As I continue, there is another road down into Hamilton. This is no more attractive to me. What there is left of road on the ridge seems to dwindle away as I continue on it. The evidence of prospects and mines, including a toilet seat because it is always nice to have somewhere to sit, continue. Surveyors have been here, too. A wooden stick marking a claim and another bit of plastic glued to rebar at the high point. Looking back from near the high point to the high point of Babylon Ridge and Mount Hamilton behind. From the top, I can see my car tucked in on the side of the junction of two thin roads, one leading right up into the valley below me. That is my route, through sages and grasses and ever increasing evidence of cows grazed in summer. I do not hurry, it is still cross country and important to pay attention to how I place my feet. Halfway along, there really is road. It does not get much use, but is easy enough to hike. It probably connects with, or is, that last road I snubbed on the way past and would have likely been an easier hike back. Cross country, or on fading road if my map is just out of date, through the canyon slot would have been even easier, but I would have missed a some fun things. There is a little water in the middle of the valley, probably from a nearby spring. It is the first water I have seen today that was not falling frozen from the sky and it is just a few feet from the car. As I get there, I quickly grab something puffy to pull on before trying to figure out how exactly to get this thing safely turned around and back to the light duty road. Upon some cozy and warm reflection, it is not so bad as I felt it was when I parked and I am quickly moving to check out Hamilton and Treasure Hill again. Unfortunately, there is a thin, slightly deep creek crossing the road that looks like a good place to get stuck if I push it, so Treasure Hill was not going to happen anyway. It was about time for a slightly epic hike anyway.